a few weeks ago I returned from a short trip to Malawi where I met Larry Johnson who was busy drilling holes in rocks! In the video clip below you'll find out what these rocks were used for. The good news is that Alan found a company in Malawi that can produce the main body of the anti-netting device with the "barbs" already welded on. This will relieve Nigel from welding these hundreds of contraptions in his free time. These devices are filled with three water bottles (in case the device ever gets leak the tight water bottles will still keep it afloat) and sealed with epoxy. A stainless steel cable is attached to the eyelet at the bottom and to a half-ton rock! See how they place these things. A lot of work but it will keep the illegal fihermen out of park waters and protect "our" cichlids. THANKS TO YOU ALL!! 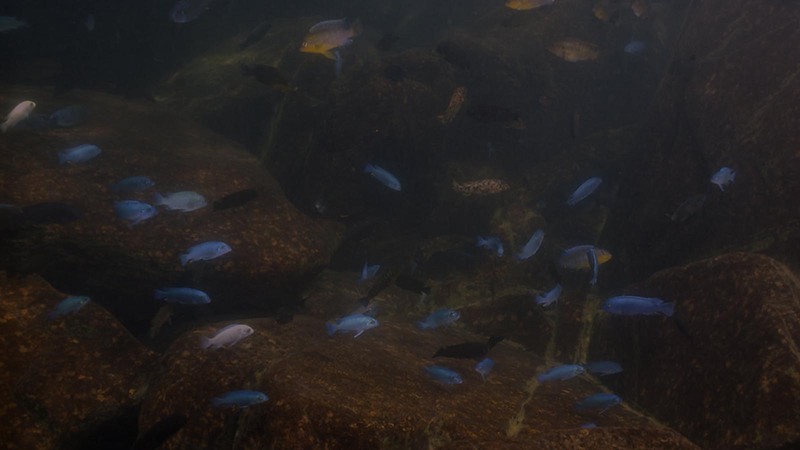 Without your input and generosity many Malawi cichlid species will not be there 20 years from now.